Our track at Park Orchards ready for racing! 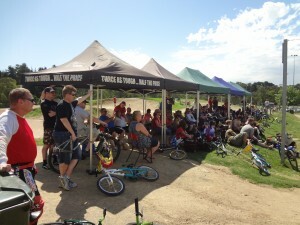 BMX Racing is all about having fun.......Come and Tame the Panther @ Park Orchards BMX Club! Some of the riders over the first doubles! Everyone is welcome to come and watch for free! 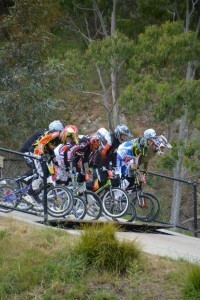 BMX racing is a type of off-road bicycle racing which was derived from motocross racing. 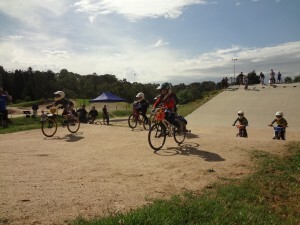 BMX bicycle races are sprint races on purpose-built off-road single-lap race tracks. The track usually consists of a starting gate for up to eight racers, a groomed, serpentine, dirt race course made of various jumps and rollers and a finish line. The course is usually flat, and has large banked corners that help the riders maintain speed. The sport of BMX racing is facilitated by a number of regional (state) and international sanctioning bodies. They provide rules for governing the conduct of the racing, specify age group and skill-level classifications among the racers, and maintain some kind of points-accumulation system over the racing season. The sport is very family oriented and largely participant-driven, with riders ranging in age from 4 to 60, and over. Professional ranks exist for both men and women, where the age ranges from 19 to 40 years old. A BMX “Race” bike is a strong, quick-handling, lightweight derivative of the standard 20-inch (510 mm)-wheeled BMX. BMX racing rewards strength, quickness, and bike handling. 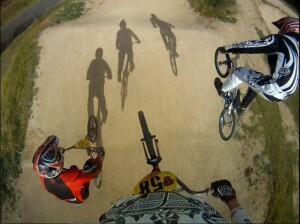 Many successful BMX racers have gone on to leverage their skills in other forms of bicycle and motorcycle competitions.